Have you ever wished your life was a Missguided video? Well at Nikki Beach Dubai, it basically is. 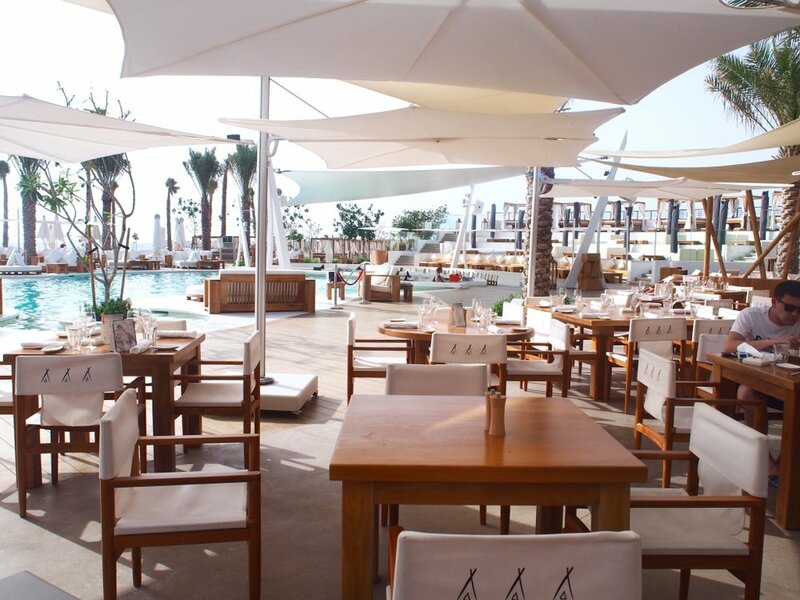 As part of a favourite chain around some of the hottest parts of the world, we actually learnt that Nikki Beach was named after the owners daughter who died in a car crash at 18 years old. Always the life and soul of a party, what better way to remember your daughter, and now they boast clubs all over the world which attract only the coolest socialites. In fact, after Naomi Campbell had a white party there, the popularity of it meant Nikki Beach now have their own usually sold out white parties every year. 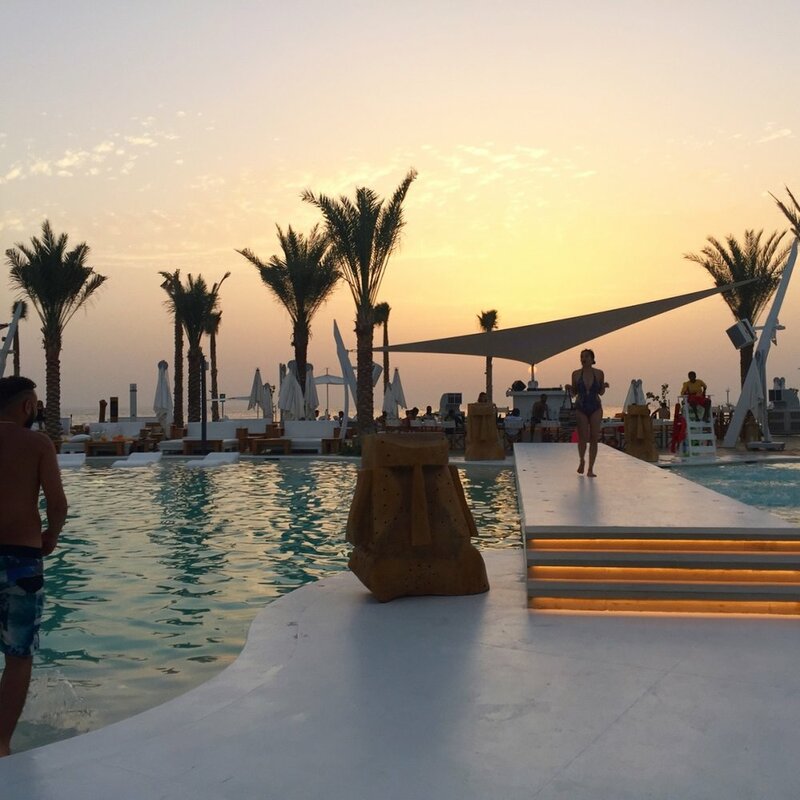 Nikki Beach Dubai is relatively new; with pool bars, private beach loungers and rooms, DJ sets till midnight and of course those amazing flamingo and swan floats, it's easy to see why the young and influential party into the evening. The beautiful beach just a step away where you can watch the sunset definitely seals the deal. When the sun has set, it also has two restaurants for fine dining and cocktails where we had some delicious sushi, chicken satays and moreish peach Bellinis overlooking the venue. They were kind enough to also show us their new property that is next to the resort; going from villas perfect for a honeymoon (rainfall showers, personal pools and built on the beach) to hotel rooms and property to even buy at the end, you could spend your entire time at Nikki Beach and not get bored. Hen do or birthday anyone? Being treated to drinks, whist lounging on a whimsical animal and then having the newest tunes and remixes being banged out, it made me wish there was a Nikki Beach London. It might be rainy but with the vibes it gives out, I'd be there every day. Thanks so much to Nikki Beach for holding us up! Check out some of their events and locations.